Germans unveil 'star wars' laser than can shoot a drone out of the sky from TWO MILES away and cut through a steel girder at 700 yards. The 'eyes' of the laser weapon, which can track an object the size of a bullet, and hit a drone from two miles away. One of the most powerful laser weapons ever fired has successfully shot drones out of the sky from two miles away. The groundbreaking weapon uses a high powered 50kW laser, and is powerful enough to cut through a steel girder from 1km away, yet accurate enough to hit a target the size of a mortar round. Rheinmetall Defence, the firm who developed it, say it could eventually become commonplace on the battlefield, and are developing a smaller version that could be taken to the front line to protect troops. 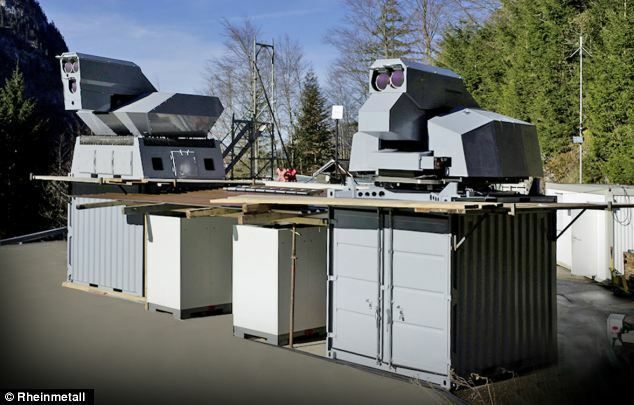 The latest test was conducted at Rheinmetall’s Ochsenboden Proving Groud (EZO) in Switzerland, in snowy conditions and blinding sunlight, and engineers are already drawing up plans to double the power of the laser before its next test. The team was also able to use the system to track and blow up a ball bearing the size of a mortar round. 'A steel ball measuring 82 mm in diameter and travelling at approximately 50 m/sec, the target replicated a mortar round, the firm said. The Skyguard fire control unit immediately detected the target, followed by mechanical tracking with the 30kW laser weapon station. The system is currently mounted of a series of large metal containers. However, the firm is developing a smaller, portable version that could easily be transported to the battlefront. Robonauts are go! R2 the robot astronaut begins work on the International Space Station. Why the first man on Mars could be tired and grumpy: Scientists find sleep deprivation biggest issue facing missions to other planets. The optical tracking system in the Beam Forming Units (BFUs) in the individual laser weapon modules performed fine tracking of the UAVs. 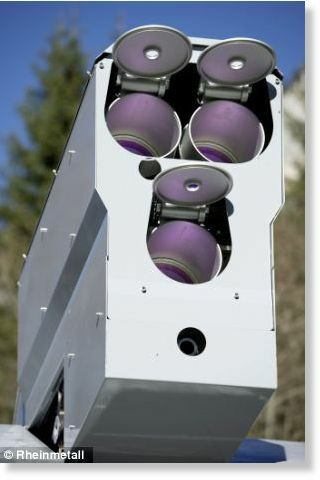 After reaching the programmed fire sector the laser weapon modules engaged the UAVs immediately and destroyed the incoming UAVs within a few seconds. The third highlight: detection, pursuit and successful engagement of an extremely small ballistic target. One of the two laser systems used in the test, which are powerful enough to cut a steel girder from 1,000m away. Heute waren schon 5 visitors (23 hits) hier!